Suitable for meditators of all levels, an audio training for discovering the effortless intelligence beyond thought. “Effortless mindfulness” is innovative teacher Loch Kelly’s term for an advanced yet simple form of mindfulness, designed to access a natural, loving flow state in the midst of our daily lives. With Effortless Mindfulness Now, Loch helps us transition from a foundation of basic mindfulness to the skills of effortless mindfulness. Over the course of four transformative sessions, Loch gives practical techniques to step back from thought-centered identity to live from an optimal way of being and doing. With contemporary versions of ancient meditations made newly available, Effortless Mindfulness Now offers ways to shift into natural intelligent awareness with your eyes open at work and in relationships. Effortless awareness has been described in traditional literature as being so close it cannot be seen, so subtle it cannot be understood, and so good it cannot be believed. With Loch Kelly’s guidance, you learn how awareness can “turn around” and awaken to this new operating system of heart-mind, to live from a place of natural compassion, joy, and creativity. Effortless Mindfulness requires no prior experience with any sort of mindfulness or meditation practice, yet it is also the next logical step for those who have been doing basic mindfulness or other meditation practices, and those who have already worked with Loch’s “glimpse” practices will find this to be a logical extension of and refreshing addition to those practices. These glimpse practices are intended to point to and give direct access to the awakened state. You do small glimpses many times. The audio book is broken down into four sessions, each of which consists of various glimpses and accompanying audio segments which flow together nicely to create a coherent and cohesive experience as the listener moves through and attunes to them. What follows is my non-comprehensive summary of those four sessions. The first session explores going from thought-based knowing to awareness-based knowing, and basic mindfulness to effortless mindfulness. Session two includes an effortless mindfulness glimpse practice that uses the sense doors as a vehicle to reveal awake awareness, where effortless mindfulness fits into categories of meditation, attention versus local awareness, and moving into awareness-based knowing. Session three includes mindfulness in contemporary culture, maps of basic mindfulness and effortless mindfulness and the exploration of these through the glimpse practices. Just as basic mindfulness is associated with the Four Foundations of Mindfulness, Loch has formulated five foundations or stages of effortless mindfulness which are then explored through glimpses. While basic mindfulness points to who or what we are not, effortless mindfulness shows us what we are. 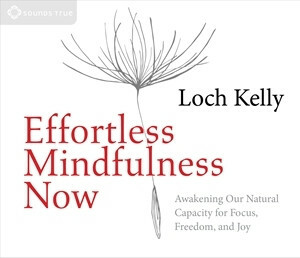 It was so gratifying to listen to Loch Kelly’s description of what I’ve come to think of as “the missing piece of mindfulness,” that is, mindfulness of awareness itself. I was particularly fascinated by his discussion of allowing the knower and the known to be in the same place. "Being aware from wherever you are aware of" is a huge step toward embodied awakening. "Not only are you aware of space but notice that you are aware from space." Another enlightening section is his description of awake awareness as the addressee of the glimpse instructions: “The unique thing about this direct inquiry method that uses awareness rather than thinking, is that when I'm asking you to glimpse, I'm not talking to your ego, I'm talking to you, the awake awareness. And I'm asking you through the ego, and through the clouds of ignorance, and through confusion, 'Knock, knock. Hey, Awakeness, can you please unhook from thought and notice yourself?’ “ Great stuff. He also touches on illuminating subjects such as sub-personalities, motivation, the “mini-me,” the Five Foundations of Effortless Mindfulness, and the Three Stillnesses.